Record Nations specializes in document storage and scanning services, but the life cycle of your records and documents doesn’t just end with storing or scanning them. Once a document is scanned or when archived documents exceed their required retention time, it’s vital to shred and dispose of them properly to help maximize your document storage needs and limit your legal liability. We’re here to help you through every step of your document management plan and any document conversion process, which should include a document destruction plan. Clean up and dispose of non-critical documents in your storage room or file room before you start your scanning project or store your documents off-site. The best way to protect yourself, your employees and your company is to use Record Nation’s secure document destruction services. 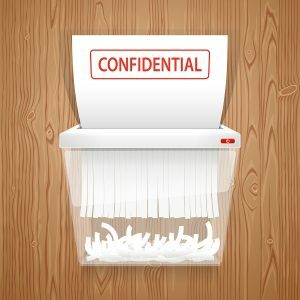 Not only does it give you peace of mind that your information is being properly handled and destroyed, it protects your company’s critical documents right up to the second they are shredded. Get Free, No-Hassle Quotes on Document Destruction Today! Our certified shredding partners provide you with a certificate of destruction for verification that the shredding was done right and to ensure that you maintain chain of custody. Let us help you dispose of your documents securely and minimize the chance of critical files falling into the hands of identity thieves or your competitors. Within minutes of receiving your request, you will receive free quotes from experts in your area so you can select the contractor that fits your project and your office best. You can also visit our sister site for more shredding service information and resources.